Go with a Pro! Outdoor adventure specialist and PRO owner, Bobby Bower has more than twenty years exploring the mountains and fashioning adventures in West Virginia. As an expert river guide, professional angler, arm-chair historian and native West Virginian you will be in good hands with Bobby. If you call other outfitters for a fishing trip, you speak to a reservation person that sits in an office all day and will give you a pre-determined trip time. When you call PRO, Bobby talks to every trip planner to schedule logistics that best suits your time and needs. Pro River Outfitters has a 100% customer satisfaction rate and we plan on keeping it that way. To Book a Trip: Just give Bobby a call and we can set you up a custom trip. We will put you down in the book to hold your spot. We are the only outfitter around that does not require a deposit. If you trust us to take you on a trip, we trust you to show up. 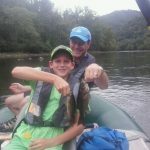 Pro River Outfitters Guide Staff: In 2015 the PRO guides averaged 18 years of experience on the rivers and streams of southern West Virginia. We are true anglers and most of us are fly fishing enthusiasts. PRO’s Fishing Equipment: PRO fishes with a fleet of 14′ Rocky Mountain Rafts© self-bailing rafts. These high-quality, durable rafts make a great platform for the all-aluminum and stainless Custom Raft Frames™. Fish all day in comfortable, elevated, high-backed, padded seats. You’ll reel in your catch with one of our Bass Pro© spinning rods or Temple Fork© fly rods. Most other outfitters charge extra for equipment. We don’t! Whatever your preferred fishing style, our staff can help you perfect your technique with a fly rod or a spinning rod.